1. Carefully inspect pipe and fittings. a. Make sure that there are no cracks or other flaws in the pipe and fittings. b. Check inside diameter of pipe using a .45 caliber cartridge as a gauge. The cartridge case should fit into the pipe snugly but without forcing. c.	Outside diameter of pipe MUST NOT BE less than 1-1/2 times the bullet diameter. 2. Follow procedure of Section III, No. 1, steps 4, 5, and 6. 3. Cut stock from wood using saw or knife. 4. Cut a 3/8 in. (9-1/2 mm) deep groove in top of stock. 5. Screw couplings onto pipe. Screw plug into one coupling. 6. Securely attach pipe to stock using string or tape. 8. (Optional) Bend bolt for trigger. Drill hole in stock and place bolt in hole so strap will be anchored by bolt when pulled back. 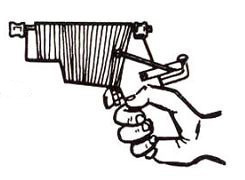 If bolt is not available, use strap as trigger by pulling back and releasing. b. Wrap string or elastic band around extractor groove so case will seat into barrel securely. 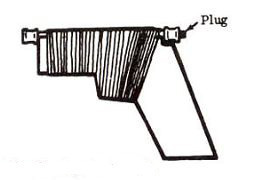 c. Place cartridge in pipe. a. Pull metal strap back and anchor in trigger. b. 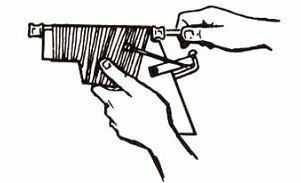 Pull trigger when ready to fire. NOTE: If bolt is not used, pull strap back and release. a. Remove plug from rear coupling. b.	Insert rod into front of pistol and push cartridge case out.